I’ve spent the past month wondering how I would tackle Valentine’s Day here on the diaries. I thought long and hard about writing an “anti-Valentine’s Day” post, since I personally feel that the day is just a way for stores to make extra money with all the cards, candy and flowers that get bought specifically for V-Day. Although I guess having a universal day to say “I love you” to someone is kind of sweet… in that “give you an instant cavity” kind of way. What I find really ironic here is that I can’t stand the holiday, yet I bought my boyfriend’s gift a month ago. I don’t even do my Christmas shopping until a week or two before, and I love Christmas! As I was logging on my computer to write what would be my infamous anti-Valentine’s Day post, I came across a post from Val of In-Between Life entitled Valentine’s Day Quiz and curiosity got the best of me. It turns out another blogger, Erin at Two Thirds Hazel, created an editable quiz for other bloggers to download, fill out and link-up on their own blogs for the special day. So, rather than be a pessimist about Valentine’s Day, I decided to fill out the quiz since well, I love doing quizzes (that are non-academic related). 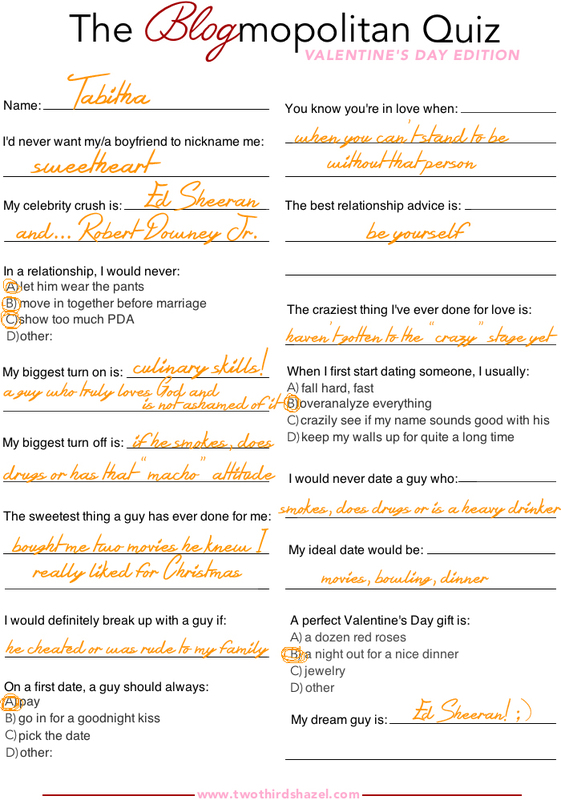 So, there’s my filled out version of the quiz! If you’re looking for a Valentine’s Day post idea or you just want to fill out a quiz, the original blank sheet can be found here. I just want to give another shout-out to Erin of Two Thirds Hazel for creating this quiz and link-up! You should definitely go and give her blog a look! Other than that… Happy Valentine’s Day to everyone!